Thursday seems a good day for an Ideas Worth Sharing (IWS) gathering post. Because I love patterns and systems, and like Hercule Poirot, order and method, these are roughly categorized by the areas of focus mentioned in Luke 10:27b – “You shall love the Lord your God with all your heart, and with all your soul, and with all your strength, and with all your mind; and your neighbor as yourself.” Perhaps you’ll be inspired to gather your own scrapbook of things worth sharing! 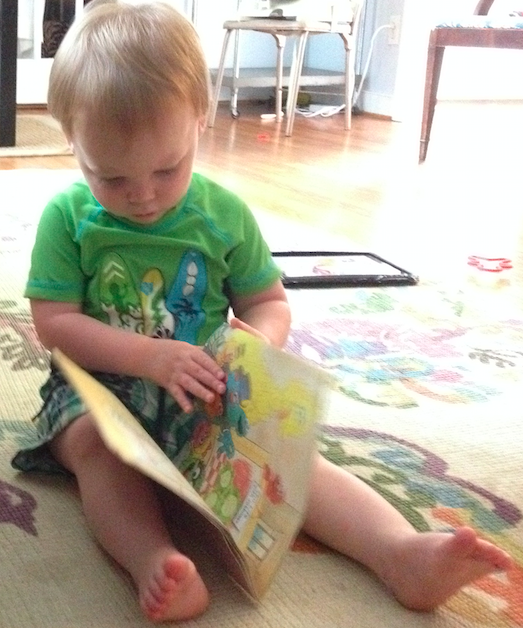 Nothing makes a Grammi happier than seeing a child with a book. Although I enjoy seeing this particular child and his big sister any time! Having books always accessible; seeing books read by other family members; and enjoying cuddle time during a story will almost certainly ensure a love of reading, which usually translates nicely into a love of learning. “Are We Educating Humans or Machines?” In this brief post on the Circe Institute blog, Danny Breed suggests that creativity, beauty, and joy, rather than problem-solving, are central to human learning. This I believe whole-heartedly, and it’s something you’ll be hearing more about in weeks to come. The Tallis Scholars has long been my favorite musical group (fortunately, I’ve never had “cool” or “hip” as one of my goals!). Here you may listen to a selection from Spem in Alium, one of the first musical albums I ever purchased. I find it meditative, uplifting, and inspiring. Want your homemade bread delivered by horse-drawn wagon? If you live in Vermont, it could happen! In this delightful article from Mother Earth magazine, Erik Andrus of Good Companion Bakery describes how and why he built a custom horse-drawn wagon to take his breads and pastries to the local farmer’s market. Be sure to notice how Erik shaped his business to fit his personal values of community and sustainability, as well as his interest in woodworking and working with animals. Andrus marches to the beat of different drummer, and he has crafted a unique niche for his business. Have you seen the PovertyCure video series from Acton Institute? If not, I highly recommend it. It offers an eye-opening look at the benefits of micro enterprise as a weapon against poverty, as well as a look at the unintended consequences of thoughtless charity. It’s sobering to know that the bundle of clothing you donate today may be part of the tsunami of free or cheap goods that drives a native entrepreneur out of business, shuttering a small factory and leaving people unemployed. This would be a good series to watch in a small group or church setting. Wardrobe isn’t always a concern for home-based entrepreneurs, but most of us must occasionally emerge to attend a conference, meet a client, perform a service, or whatever it is. When we do emerge, it’s nice to have some idea of what is considered proper business wear. Advice on Career Attire, from Mary Sheehan Warren of ISY Fashion, offers a fairly detailed overview of what to wear to meet the standards for executive business, business, or business casual styles. You may not follow every jot and tittle (I don’t), but it is always good to know what is expected, and Warren’s advice seems practical, taking modesty and budget into consideration. I really appreciate everything you do, from your beautiful curriculum offerings to all your sensible advice on your various blogs. I wanted to comment on your love of the Tallis Scholars. Though I’ve always loved good, sacred, choral music, I’d never heard of them until I heard a recording of theirs on the radio a few weeks ago. It was gorgeous. I’m so glad you enjoy these things, Sarah. It’s a privilege and blessing for me to be able to share in these ways. And yes—the Tallis Scholars are a joy to hear. Ever since I discovered them, their album “Spem in Alium” has been the first thing I reach for when I need a moment of calm, concentration, or joy. Like the Cloisters in New York City, the Tallis Scholars take us on a journey into beauty. May you and your family have a joyous Thanksgiving!